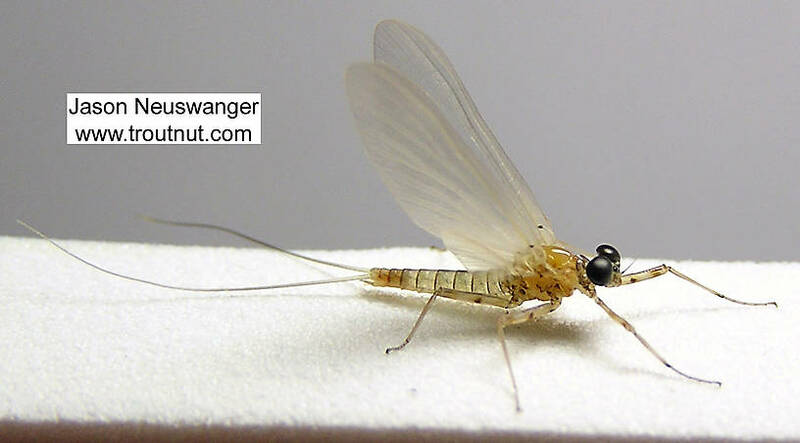 This is my favorite mayfly from 2004, and it appears on my popular Be the Trout: Eat Mayflies products. Check them out! Its identification is really up in the air. It might be a late-season vitreus dun but it may very well be one of the more obscure species in that genus. 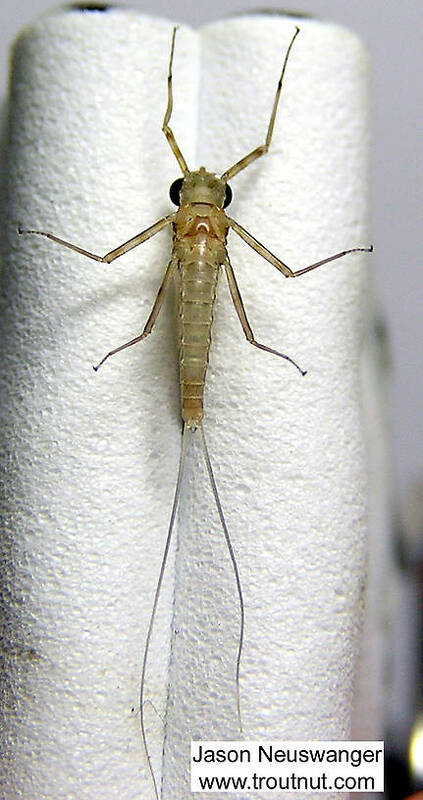 This mayfly was collected from the Beaverkill River on September 2nd, 2004 and added to Troutnut.com on January 25th, 2006. This is one of my favorite specimens from the old site pictures. 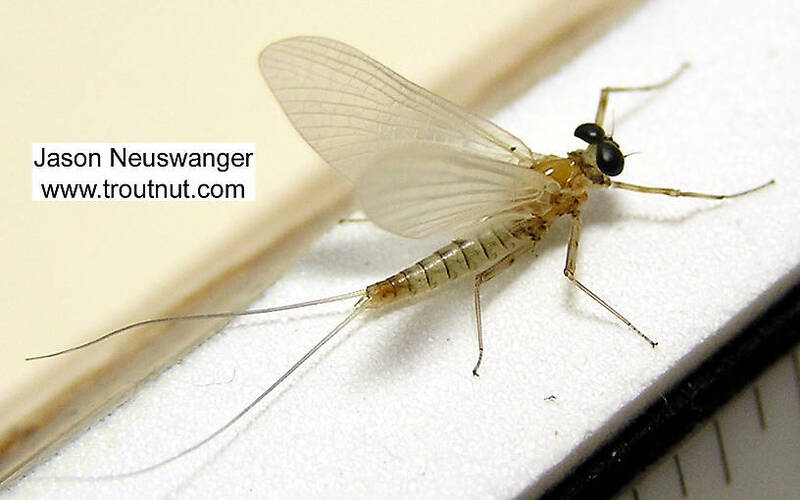 I collected it in early September during a fishable hatch of its kind on a smooth, deep pool on the Beaverkill. The eyes seem nearly contiguous, the first two segments of the fore tarsi are of equal length, and the wings are unmarked, all of which suggest Epeorus. From the above/side picture I can see that the basal costal crossveins do not slant upward as they should with Epeorus, although the main side view seems to maybe show that. I wish I had a better camera when I photographed this one. 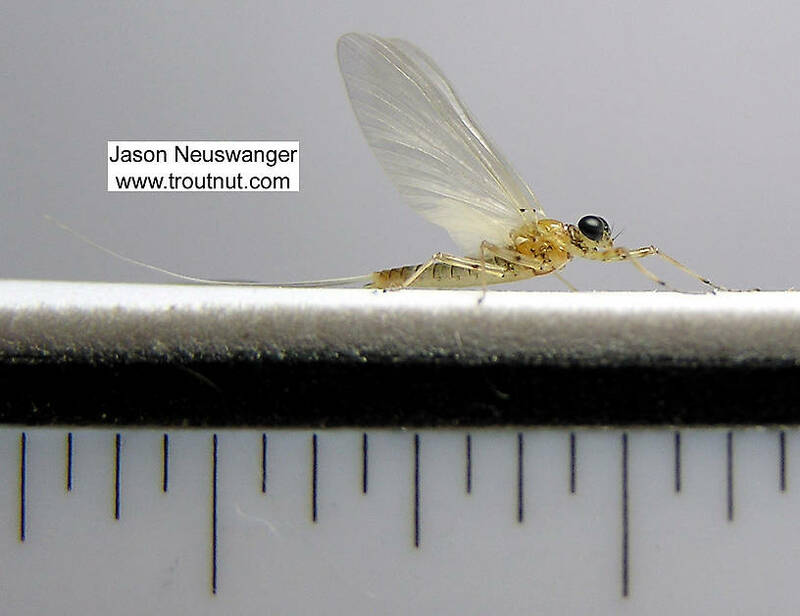 It also pretty strongly resembles the E. vitreus dun shown in Ted Fauceglia's book, Mayflies. It clearly does not match the E. vitreus dun pictured on Color Plate XII of Hatches II, but it looks like the unidentifeid eastern Epeorus species on Color Plate XIII of the same book. By some accounts, there does not seem to be a common eastern species of Epeorus hatching this late, but other books show it on the tail end of the emergence times for Epeorus vitreus. So that's my best guess for now.